Contemporary styling. Anti-clog rubber tips for easy cleaning. Tangle free hose design. Four selection settings include full spray, massage spray, combination full/massage spray. 2.5 GPM max flow rate. Includes 60in hose and mounting bracket. Inspired by natural elements and soft modern lines, the Attract 6-Function Hand Shower in Chrome offers a streamlined look that fits into any decor. The Magnetix docking system allows for easy release and securely snaps the handshower back into place, even with your eyes closed. Included 60-inch kink-free metal hose extends your reach and flexibility. Installation is quick and easy, requiring only a wrench and 3 simple steps. Smooth graceful and elegant, Fina proves that sometimes it's the quiet statements that grab the most attention. From finishes that are guaranteed to last a lifetime, to faucets that perfectly balance your water pressure, MOEN sets the standard for exceptional beauty and reliable, innovative design. This hand shower includes a 69 -inch hose, vacuum breaker, and wall bracket. Iso 6-Function Hand Shower in Chrome Wash the day away with this In2ition Two-In-One 5-Spray Hand Shower/Shower Head in Chrome. 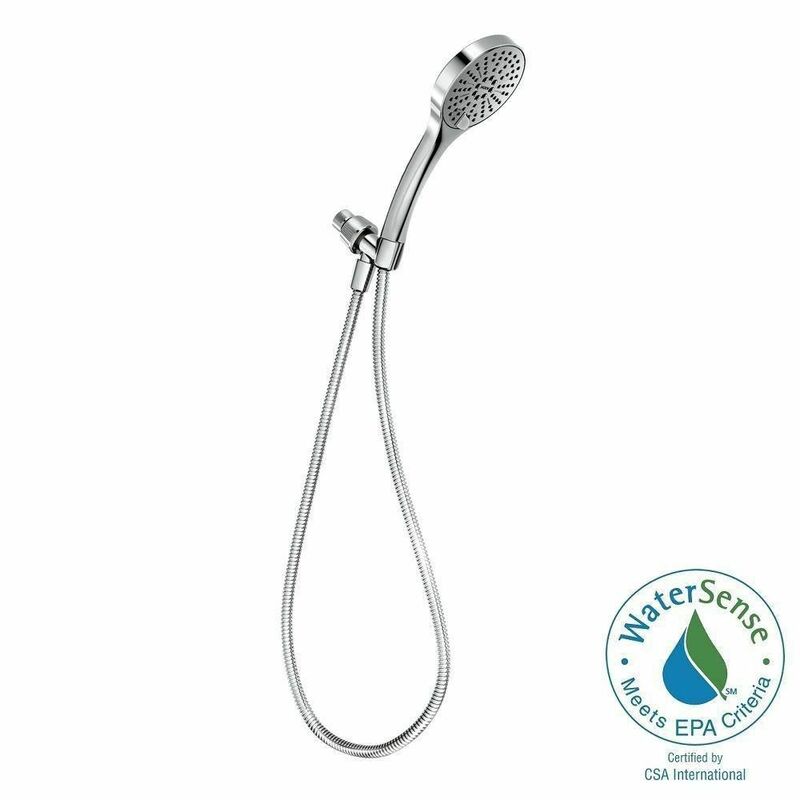 Use the integrated shower heads together or separately to get water where you need it most. With five (5) different settings, including a pause feature, this hand shower has you covered from top to bottom, or bottom to top. This super functional handshower gives you water any way you need it, anywhere you want it. Use the innovative pause function to reduce the water to a trickle, allowing you to conserve water while doing such tasks as lathering up or shaving your legs. Buy with confidence, knowing that Delta backs all of its products with a lifetime limited warranty. Iso 6-Function Hand Shower in Chrome is rated 4.3 out of 5 by 25. Rated 5 out of 5 by George from Very easy to install. Modern appearance. I have installed three. Two in my house and one in ... Very easy to install. Modern appearance. I have installed three. Two in my house and one in my sister's house. Rated 1 out of 5 by mjs1234 from Made of cheap plastic Purchased 2 of these thinking Moen was a reliable brand for shower heads. But these shower heads are made of cheap brittle plastic. The base for one of them cracked after only 4 months, and we can no longer place the shower head on it. I wish Home Depot made it easier to view what kind of material the products they sell are really made of. Rated 5 out of 5 by homeowner from great shower head So far we are very happy with this shower. The pressure is good, it has several settings and it looks beautiful. It wasn't too hard to install it. Rated 5 out of 5 by Greasemonkey from This is what you need for a REAL SHOWER! Perfect hose length and does not tangle up. Works excellent for our one shower house with three people and two dogs, Gives a full rinse and does not leave soap in your ears. Hose is perfect length and does NOT tangle (has some metal to prevent this) I removed the water limiting plug because we only have ONE shower and MORE WATER IS USED WITH the limiting plug INSTALLED! (self defeating to me) works great for washing our pets as well. Works well for older homes where the plumbing stub height is for someone less than five tall as in the old days they didn't think we would get any taller than that, This adds about 6 inches to the overall height of the shower head. Impressed with MOEN PRODUCTS. Rated 5 out of 5 by Belle from Great Addition This is the perfect hand held shower device. many different adjustments for your own liking. How many gallons per minute pressure does this shower head produce? Thank you so much for your interest in Moen products. The 26056 provides 2.0 gpm (7.6 L/min) max. If you have additional questions, please complete the form at http://www.moen.ca/consumer-support/contact-us or call Moen at 1-800-465-6130. Our business hours are 7:30 a.m. - 7:00 p.m. Monday through Friday EST.